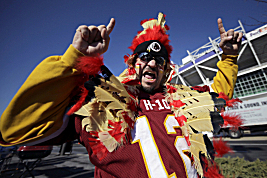 Newspaper Rock: Activists: Vikings stadium should ban "Redskins"
By Tim NelsonA long-simmering controversy over the name of the Washington, D.C., NFL franchise is heading toward the Twin Cities. Native American groups and supporters say the construction of a new Minnesota Vikings stadium offers a chance to put new pressure on the NFL to rethink the Washington Redskins name and logo. Opponents, however, aren't appealing directly to the NFL, the Vikings or the Redskins. Instead, they want the state board building Minnesota's new stadium to ban the word Redskins on publicly owned signs or address systems at the new facility as well as one last time in the Metrodome when Washington plays here Nov 7. By Associated PressMSFA Chair Michele Kelm-Helgen told the Star Tribune the board heard and understood those concerns when they were raised at last week’s meeting but that it’s too early to make a move. Stadium authority spokeswoman Jenn Hathaway said the board may have a formal response next week.AIM Minneapolis Will Protest When Redskins Play Vikings November 7On October 14, two affiliated AIM (American Indian Movement) groups, the AIM of Twin Cities and AIM Patrol of Minneapolis, released a statement condemning the use of the name "Redskins" by the Washington NFL team, and soon thereafter announced plans for a public protest when the team comes to town for a matchup with the Minnesota Vikings. [T]he attorney for the Minnesota Sports Facilities Authority says they cannot put legal parameters around what can and cannot be said inside the Metrodome. He said the role of the Authority is to provide public accommodations, not put prior restraints on free speech.